The Tuesday before Holy Week is dedicated to the Divine Prisoner (Divino Preso) focusing on when Jesus was in prison awaiting Crucifixion. To celebrate the clergy from Sana Escuela (the church next to the Parrochia) would have food prepared especially for the prisoners in San Miguel’s jail. The day before the priest would hear confessions and celebrate a mass at the prison. 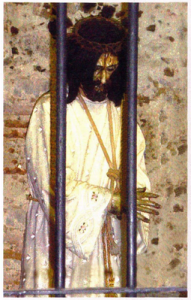 On Tuesday church members along with friends and family of the prisoners would bring the image of Jesus behind bars and food to the prison. Today, due to security, only a priest and one other person is allowed into the prison to visit this day.